Yoga Sprout features fun, comfortable athletic wear and accessories with vibrant colors and playful patterns. This adorable 2-pack swaddling set features breathable, soft 100% cotton muslin fabric in bright prints that is sure to keep your active little sprout comfortable and secure. At a generous 46x46", these blankets are ideal for a multitude of uses, from stroller covers and swaddling to nursing covers and summer blankets! Mix & match additional garments from our coordinating Yoga Sprout Collection! From happy baby pose to every day adventures, grow, relax & be happy, with Yoga Sprout! Great price and exactly what I was looking for. Light fabric makes it perfect as a baby blanket or for swaddling! 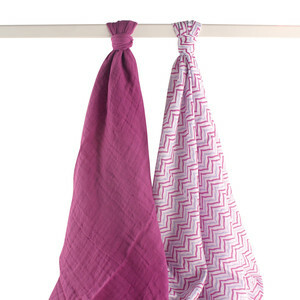 Hudson Baby muslin blankets are wonderful - lightweight and strong material. The blankets are bigger than the competition. Recommend it - perfect blanket for my baby. Blanket is large, light fabric weight and versatile! Nice and large blanket is perfect for swaddling. Fabric is thin so baby does not get too hot and fabric is very breathable. Washes well and are very large. Perfect to wrap around your child. Light fabric makes it very breathable for the summer. Recommend this blanket over the more expensive brands. We needed a blanket for warmer weather and these are perfect. Great value product. They have been wonderful for our baby. Blanket is larger than the competition so perfect for swaddling, very soft and beautiful designs! Love Hudson Baby muslin blankets. They are very big and after washing, they are so soft! Blankets look as beautiful in person as the picture. They become softer after washing but were not rough to begin with. Highly recommend. Hudson Baby blankets are the best! Bought several sets of the blue and pink. They are super soft and all the new parents I give them to love them. Highly recommend purchasing! Bought as a gift. I love the look and feel of them. Love this product. Excellent quality fabrics, colors and price. By hand washing them, the colors stayed vivid and the fabric didn't fall apart. I really recommend this brand and also the seller! I was hesitant to buy a brand other then Adan & Anais, but I am so glad I chose Hudson Baby muslin swaddle blankets. The blankets are larger and they did not shrink when washing. They came in beautiful prints and colors for our little girl. These blankets are awesome!!! They are so big and after a few washes they get incredibly soft! Our daughter isn't here yet, but I'm sure I will be ordering more very soon.